At first glance, artist Nathalie Miebach's sculptures look kinda like defective children's toys orminiature amusement park rides. While hercolorful work seems fun, ithas a serious undercurrent: through her sculptures, Miebach is trying tomake sense of climate change by translating grim weather data into brightly colored 3-D objects. Back in 2004, Miebach wanted"to find a more tactile, physical way of understanding the complexity of climate change," she tellsStudio 360in an email. "Utterly confused by all the charts and figures online and the endless policy debates, I found myself wanting to bring all this information into my own world --- the physical world all around me." As someone who learns best by working with her hands, she wondered, "How would our understanding of climate change differ if we could walk around the information, touch it and possibly even hear it? Would the complexity of climate change become somehow more urgent if we could learn about this directly through our senses, as opposed to through an LED screen?" 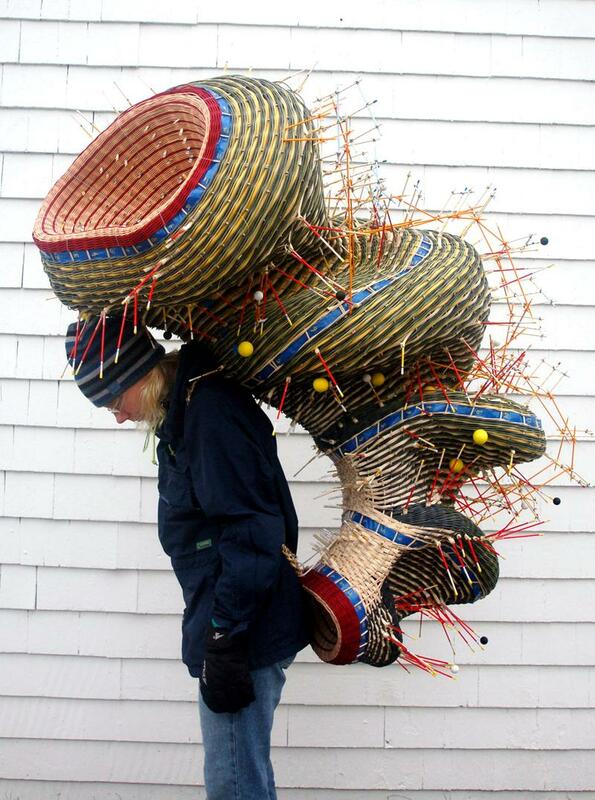 Nathalie Miebach carries her sculpture "Antarctic Explorer"
Miebach combinesdata from a weather station she built herself with historical, local, and global data she finds online to contextualize her results. "From all these numbers, I begin a translation process into the third dimension, using basket weaving as a simple spatial grid," she says. And why basket weaving, you may ask? "A basket is made up of horizontal and vertical elements" --- kind of like a graph. "When I assign values to the vertical and horizontal elements, I can use the changes of those data points over time to create the form," she explains in her 2011 TED talk. "I use natural reed, because natural reed has a lot of tension in it that I cannot fully control. That means that it is the numbers that control the form, not me." Herexploration of data visualization has also crossed mediums. 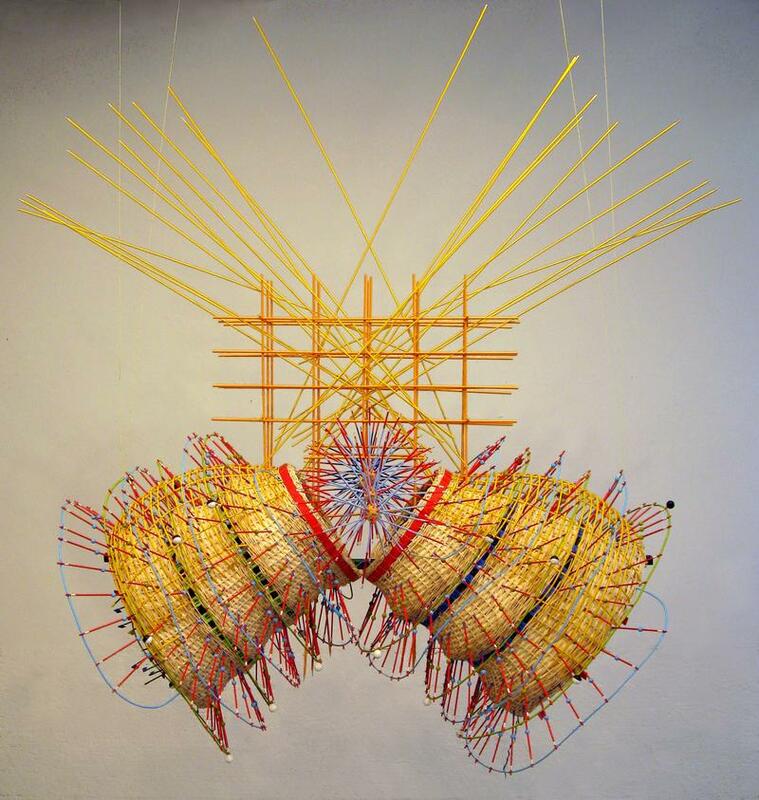 In 2009, Miebach began collaborating with musicians for her "Weather Scores" series. The music they make isn't supposed toevoke nature orweather, like, say, the music of John Luther Adams. "The goal isn't to make expressive music about weather, but to reveal a kind of nuance in the data through sound," Miebach says. 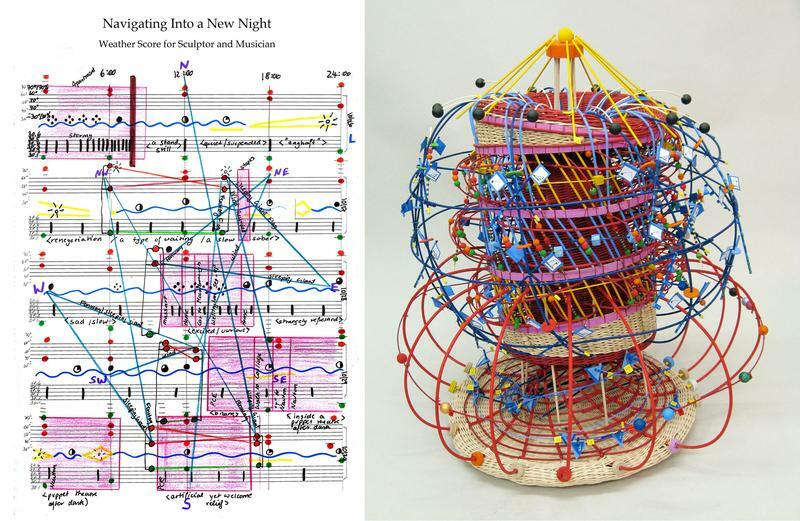 A score (L) and the resulting sculpture (R) for "Navigating Into aNew Night"
But Miebach recognizes the emotional impact that weather and climate change can have. A recent series of hers was inspired by the stories of communities hitby Hurricane Sandy. "To make huge disasters such as Hurricane Sandy relevant to the general public, you can't just bombard them with statistics and data," she says. "It's the human stories that are linked to these events that become important lenses through which to view and interpret the raw data in order to make sense of it." 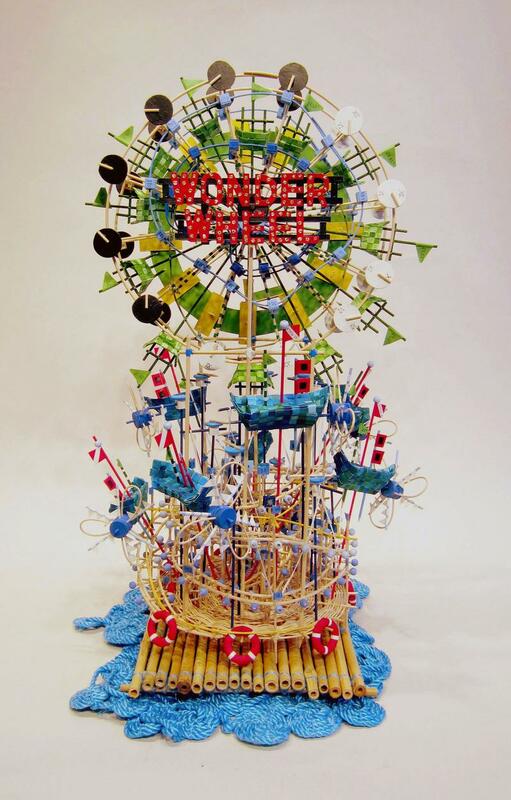 Now, Miebach is tackling a project based on Hurricane Katrina that reverses her process. "Rather than starting with raw data, I am starting with human stories about the storm and building sculptural components unrelated to data that will be the scaffolding. After I have the basic rigging down, I'll go and integrate the data," she says. This piece will premiere this fallat the Akron Art Museum as a part of their "Intersections" exhibition. One of the most rewarding things about the series for Miebach has been hearing personal stories about the weather from people who encounter her art. "Even though I'll only meet them for a moment, often not even getting their name, they leave me with a story.Weather is a great equalizer in that everyone, regardless of socioeconomic background, race, or gender, experiences it on a daily basis. It is a companion we carry with us throughout our lives."